This following post makes me tear up. Seriously. My daughter Lillie has been attending gymnastics sessions for the past… 2 years I believe. I’m not going to say this because she is my daughter, but she is very talented. I absolutely love seeing her in each and every single apparatus, but my favorite by far has to be the bars which happens to be the one she excels at. Sometimes they have meets where all they do is the floor routines, it is called a Tumbling meet. 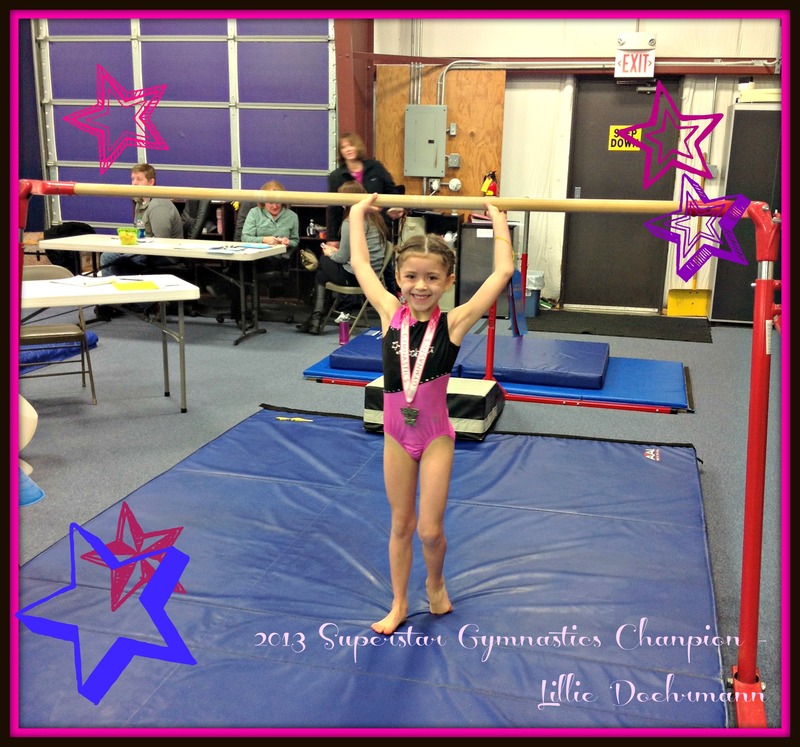 Well, this past weekend she had another meet where she competed in all of the apparatus (these are the good ones!). 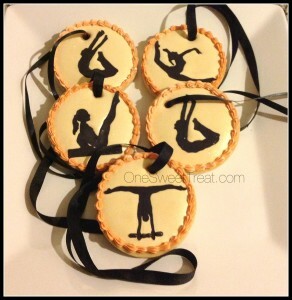 I felt the urge call to make some cookies for all of the Superstar girls – that’s the little group’s name. When thinking about what to do, the most obvious cookie design that came to my head was… Medals!! I’m so excited to show you what I came up with. 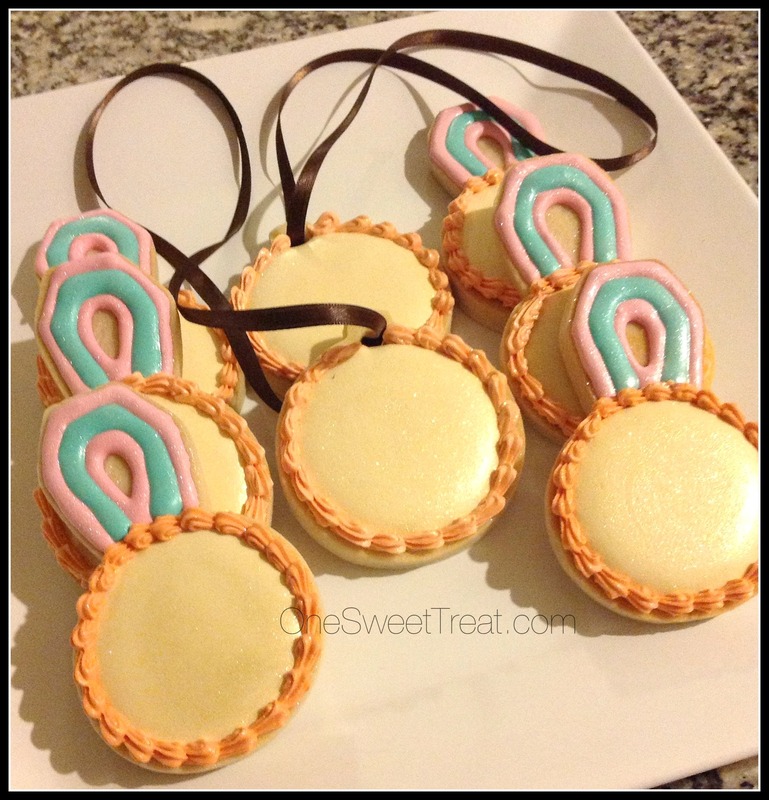 I made three different sets/types of medals. One of them has the edible ribbons attached to them. 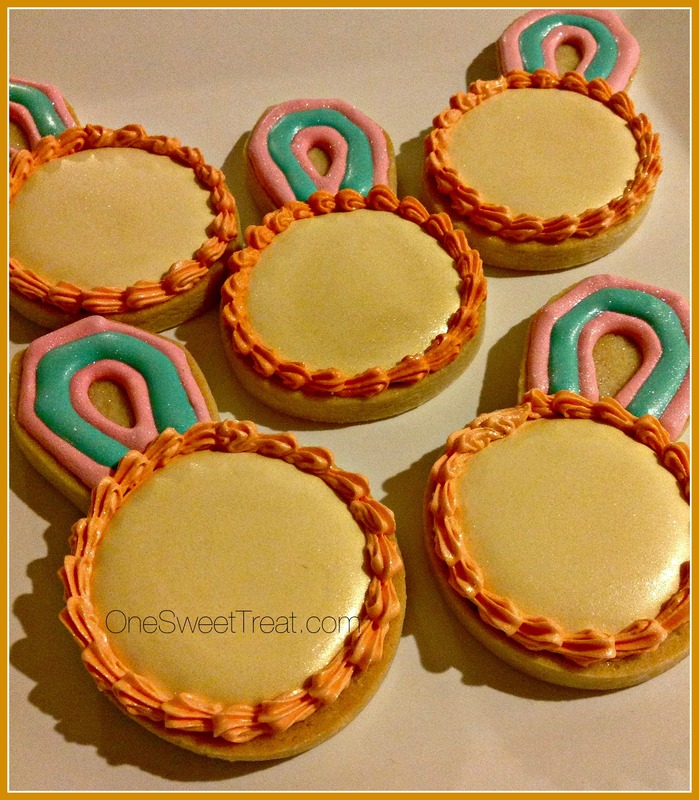 The other set has the ribbon going through a whole in the cookie. 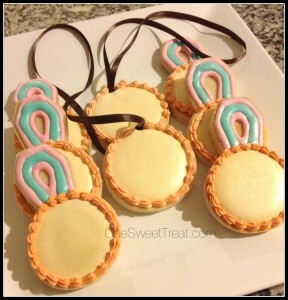 I have the third set of medal cookies here. I think they are my favorites, but the most delicate to work with. The focus of this cookie is a gymnast’s silhouette in different positions or apparatus. Two jumping or leaping gymnasts showing their elasticity. One sitting and balancing on the beam and of course the gymnast going in circles on the bars. With this particular design I made the mistake of making the silhouettes first and then deciding the size of cookie cutter I was going to use. 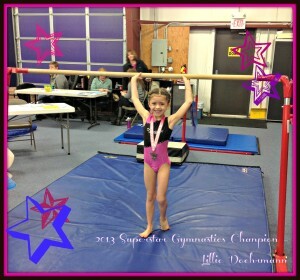 I made several girls on the beam, but I the beam was so long that it didn’t fit on the medal so very few were finished. My kids ended up using them to make their own cookies though. 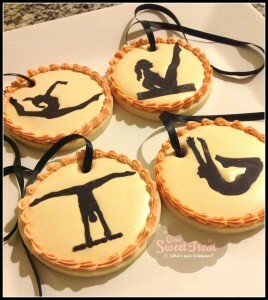 I guess the most difficult part of making these cookies was trying to hold my breath while I made the silhouette. I had to get each and each and every curve perfectly positioned. 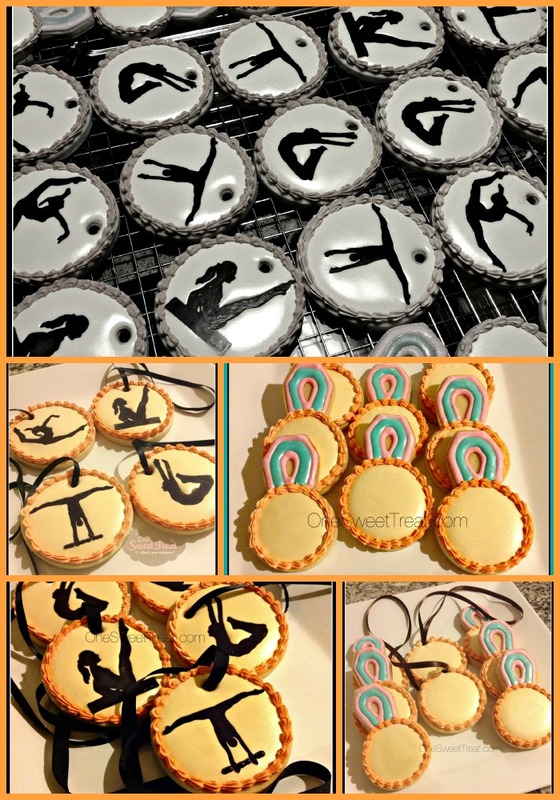 I was gasping for air after piping each gymnast! There was sooo much glitter on these cookies. I looove glitter and I use it as often as I possibly can! Unfortunately you can’t see it very well in my bad pictures, but I had to make them shine like gold right? 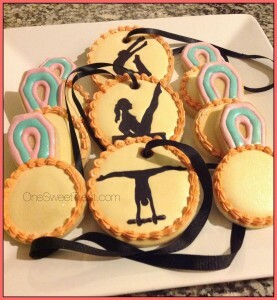 Each and every little gymnast received a medal sugar cookie for their great performance when the competition ended. They were all wonderful and they all look so cute. 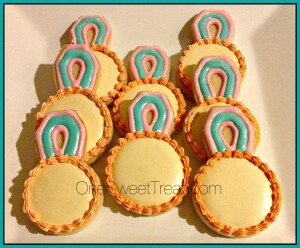 Here’s one last shot of the medal cookies I made thinking of my sweet little champion, Lillie. We are very proud parents of a little champion. Lillie won second place in floor and beam, first place in beam and bars, and earned a first place medal in the all around competition for the second time in a row. Congratulations Sweet Heart. We love You.